STAND UP for STANDING ROCK. You have seen the footage on facebook and heard the stories from the mothers, fathers, elders, daughters and sons of Dakota. The people need our assistance to fight the powers that threaten water, people, land and histories. Be part of the legacy that makes a difference, Its time to stand up for Standing Rock whanau. Less talk, More action ! Go beyond posting about STANDING ROCK on your FB or Instagram accounts and actively contribute towards empowering and supporting the fight. Stand in solidarity with the brave protectors for a evening of spoken word poetry, DJ's and Live Music. 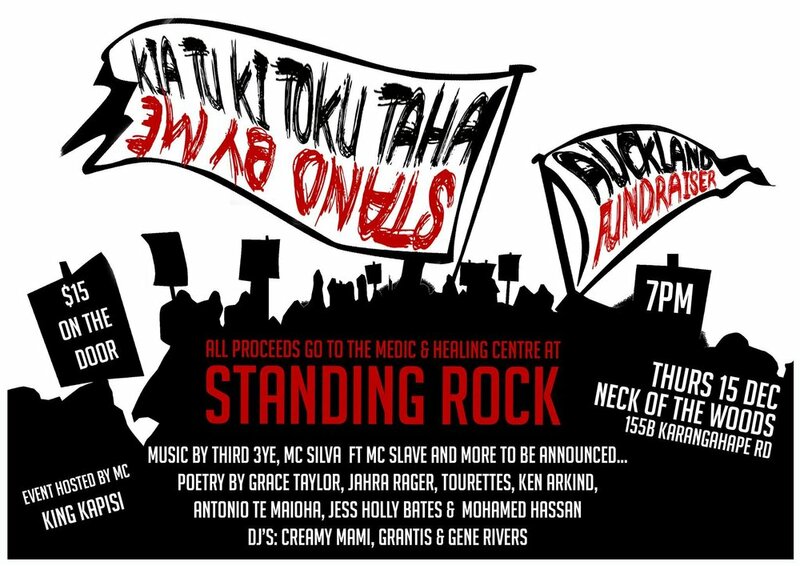 ALL proceeds will be donated to the Standing Rock Medic & Healing Council, who distrbute resources, supplies, people and aid to protectors at STANDING ROCK. This is a call for you to exercise your humanity and in return you will have one hella dope night. Although it was announced on December 5th that the "US Army Corps of Engineers announces it will NOT grant final easement for Dakota access to cross the Missouri River" - and we celebrate this moment - we must also be cautious of what actions and decisions follow thereafter. As a result of this announcement at the date of the fundraiser if the best we hope occurs then all funds will then be given directly to THE OCETI SAKOWIN CAMP at Standing Rock to distribute towards needs such as legal costs, ongoing medical costs for injured protectors, camp cleanups and the after effects of protectors returning home to finding new jobs etc.